For some reason, this former Kung Fu student of mine popped up in my head who had Multiple Sclerosis and could barely walk into my school while seeking a martial arts studio to enroll in. She walked on the balls of her feet, very stiff legged and could only take very short steps. So a few days ago I did a Google search and found she passed away in 2013 at age 62. I was bothered by her passing and had not seen her in many years. As teachers, (educators) our reward is not about the money, it’s about what value we pass on that changes a person’s life for the better. I still am rewarded throughout the years from former Kung Fu students that send messages to me telling me how I changed their life and some their children’s lives. I have had students train with me as youngsters and later came back with their child to learn what they did as they felt the value would be beneficial for their future. Liz came to class 3 to 4 times per week and always was eager to learn. Many movements were difficult for her to learn and due to the illness, she often confused her left from her right. Through repetition, dedication and desire to improve she would eventually overcome the problem. After a few years of training, she could perform Kung Fu forms with 100 plus moves and no one would ever know about her handicap. 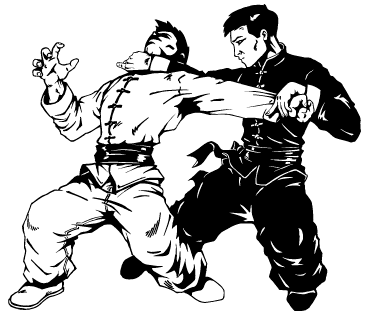 Kung Fu training has great strengthening and conditioning exercises. Kung Fu stances are difficult and performed for several minutes with each different static stance exercise. These type of exercises take discipline and mental strength to perform and when training the legs with stances, a person’s legs burn and shake through exhaustion. A healthy person has a difficult time breaking barriers to hold these stances (postures) longer so you can imagine how difficult they are for someone with Multiple Sclerosis. Liz had such an upbeat personality and outlook on life that she would smile while training and ignore the pain as well if not better than most students. Having students and friends that worked in media, the Akron Beacon Journal, Akron’s local newspaper took notice and wrote an article about her unbelievable pursuit to be better and overcome obstacles. After the article came out, I had numerous calls from people all over Northeast Ohio wanting me to cure their Multiple Sclerosis. MS is a devastating illness and I can understand the desperation to be healthy, but it was not just an enrollment in my school that would help the illness, but dedication and training hard with a consistency that made almost miraculous changes. This type of work ethic was right up Liz Krozlak alley. I ended up taking on another student with MS on a private training basis. He drove from Cleveland to Akron 3 times per week to train in hopes that his results would par with Liz’. The Cleveland student ended up obtaining solid results that made him more mobile, but nothing like Liz. I explained to him from the beginning that Liz lived and breathed to better herself through training, diet and other methods she researched and pursued. You cannot buy this kind of success in health and fitness, it is worked for and earned. Here in Vegas, so many people work out so they can go on a stage and waltz around with their new look. If entering a fitness model contest will help someone on a new path to health and fitness, I am all for it, If once the show is over and the person did not place like they hoped to and quits training, then I feel they need to have the proper mindset and work on their mental attitude from a being a better me and developing discipline to train for themselves. The ones that make it a lifestyle and not an ego booster are the ones that have depth and seek self-improvement. Do it for yourself without the need to do a show and compete with the crew next door and you will have broke ground to being happy with yourself and achieving physical and mental peace. In close Liz was always very upbeat and smiling. I rarely ever saw her out of that character. I believe that she was genuinely thankful for her life. She lived frugally and did not have much in the way of materialistic items. Sometimes simplicity is the way to keep grounded and stay on an even mental path without radical highs and lows. Along with Liz class workouts 3 – 4 times per week I would often see her running through the streets of downtown Akron. Running daily was part of the process of her success in Kung Fu and life. The older I am, the more I see the people in my past and do not take things for granted. Thinking back on her struggle and how well she dealt with it, the more I missed the bigger picture of what a solid and strong person she was. You can read the Akron Beacon Journal article about liz in PDF format. If you would like to learn more about Iron Trainer Personal Training and One on One Kung Fu training please email Don through the CONTACT PAGE or Call Direct 702.610.3896. Stay in touch with us by subscribing to our site to be notified about the latest blog articles, specials and fitness information!